It’s a long trek, but it always seems to be worth it. Ore2Shore is only surpassed in its prominence by the Iceman Cometh Challenge, and while we’re obviously partial to our hometown showdown, we’ve always had a love for the red dust and challenging, relentless dash from Negaunee to Marquette. This year, we had one of the biggest BEE contingents ever make the five-hour drive across the Mackinac Bridge to Marquette. It’s a real testament to everyone’s motivation right now; while some racers are easing off, we’re building up for a big run this autumn! With classes just a month away (and they’re already half full!) the big targets of Bear Claw Epic, Peak2Peak, and Iceman are already on the brain. It was perfect weather for a bike race on Saturday, with plenty of sun, ideal temperatures, and just enough rain in the week prior to keep the clouds of thick red dust to a minimum. 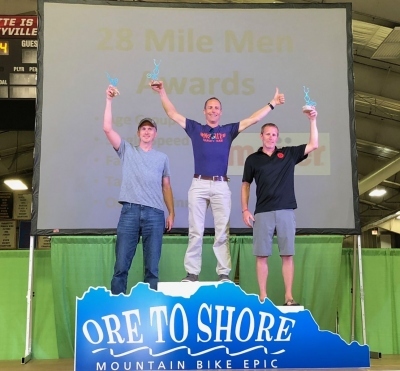 Ore2Shore offers two distances for riders to choose from, a 48 mile Hard Rock and 28-mile Soft Rock. Neither is easy, you can rest assured. Some of our heavy-hitters toed the Hard Rock with big ambitious, but O2S is a race that can often come down being smart and knowing when to push the limits. It came to no one surprise, then, that Brad Pauly posted the fast time of the team of all the BEEs, coming in 33rd overall with a time of 1:42, just off his age group podium in 4th. It was a similar story for Jon Zelinski, who has really come into his own this year! Jon put down a time of 1:44, also 4th in his age group. Brother Josh was four minutes back with some mechanical issues, still 8th in his age group. Marc Brunette and Kris Sands formed a pair of diesel engines in the group they ended up in, and those two can put out an awful lot of horsepower. They were 11th and 13th in their age groups, both coming in right on the 3-hour mark, a huge result for both riders. We also had Bill Shaver make the drive from Grand Rapids to Marquette, and even after a demanding race schedule this summer, he’s still got plenty left in the tank. He was into the finish at in Marquette after 3:07, 15th place in a massive age group. Luke Schwartz wasn’t far back in 35th place of his age group, ceding just a few minutes to Shaver and staying only slightly ahead of his better half, Anne. Anne was one of three extremely impressive ladies in the Hard Rock, led by Coach Susan. She was 4th overall with a flying time of 3:02. It’s a perfect course for her to apply the horsepower, and she made every pedal stroke count! Kasey Wierzba was 3rd in her age group, just two minutes ahead of Anne, who was fifth on the day. Maybe the most touching tribute to a fallen teammate we’ve ever seen, the 28 mile Soft Rock will be remembered as Dan Morley’s race. Our cycling community lost Dan just last month to a long and arduous battle with cancer. Ore2Shore was one of Dan’s favorite events, and his McLain Race team friends made it a priority that Dan’s memory would be remembered, and that his number plate would cross the line. Chuck Hathaway, John Edingfield, Josh Scott, George and Diana Ernst all rode together, leaving no one behind and enjoying the day in Dan’s memory. On behalf of all BEEs, kudos for the camaraderie and the class, guys! We had plenty of riders targeting the 28 mile. Dan Madion enjoyed what we have to see as a breakthrough race; he’s always been a strong rider, but this confirms he’s made a big jump up after his transition from Boston Marathon finisher to mountain bike stud. Dan was 13th overall, an outstanding finish in a strong field. Dan Spala, Jim Walters, and Jeff Wentzloff all went top five in their age groups, which is a good sign of fitness as we head near September. Roger Raehl had a spectacular race to take first in his age group, averaging 17.6 miles per hour in the process! Doug Hicks and Steve Haskin weren’t far back to nab 7th and 11th in their respective age groups. We also saw the return of Jay Briggs to competition after he so ably manned an aid station at Traverse City Trail Festival in July. Jay was in well under the two hour mark for 26th place in his age group. Chelsey Schlicht took the win in her age group, and we really can’t wait to see what she does at Iceman this fall! She has gotten stronger every single day, and women across the state had better take notice. Check out the full results from Ore2Shore here. Next up, the Short’s Glacial Hills Challenge is this Sunday at Glacial Hills in Bellaire. We’re going to have plenty of BEEs racing in the fast, flowy singletrack that makes the race so much fun, and a sneakily hilly place to race, too.